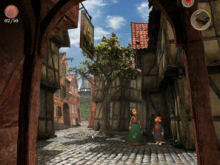 Gameplay: This game can be played using the mouse and the keyboard. The Main Menu has Start, Options, Credits and Exit. The Options menu has screen resolution, image smoothness, graphics detail, keyboard control mode, inventory display, subtitles, music volume, sound effects volume and speech volume selection. The gameplay menu with inventory, resume, options, load and save is accessed by pressing ESC key. The inventory can be scrolled using the mouse wheel or press tab. The game screen shows inventory at top right. Place the item to be used at the middle. Behind the inventory items is the action icon. Actions are done by getting Hans Christian close to the person or object and then press the left mouse button or the space bar. Move the character by clicking where you want Hans Christian to go or click-hold to guide his path. If he is able, yellow dots are seen; if not red dots are seen. Change of screen is seen using arrows at edge of screen. Double clicking makes Hans Christian run. The keyboard control works better in an enclosed place. Pressing the enter key skips dialogues and intro. Read the personal diary and follow Hans Christian's progress in the game or see what actions are still needed to be done. Hint: Be sure to talk to everyone to find out what is happening and get clues on what to do next. Hans Christian Andersen relates the story in a puppet theatre. The duck provides commentaries. The lovely but spoiled Princess in her 15th birthday decided to leave the palace to explore the world. The king orders Councilor Dunkeldorff to bring the Princess back to the palace. 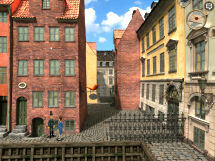 Copenhagen 1819: Hans Christian arrives in town to join the Royal Theatre and be famous. He knows he has to work at odd jobs and meet influential people first. He doesn't know what lies ahead for him. Hans Christian arrives in town. Press ESC to access the gameplay menu. See the personal diary where you can follow Hans Christian's experiences and the purse that will hold his coins. Go forward to town and see Dunkeldorff implore the Princess to go back to the palace. 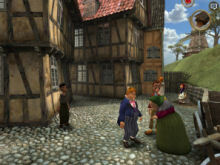 Townspeople: Go to a person by moving the cursor on the head, see a yellow circle and click; and then talk to them by clicking again when the talk icon is seen. 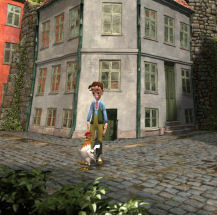 Hint: Talk to the young boy with the cap, the poor girl and Clumsy Hans to get great clues. Talk to everyone to find out what is going on. Be careful to stay away from the guard or he will fine Hans Christian for the way he is dressed. Student - Move forward and talk to the man in red coat left of the water pump. He is a student of medicine. He wants some snake juice and he will pay some schillings. The short man in red coat with hat (Clumsy Hans) says that only goblins have snake juice and at another time he says to try at the mill. Witch - Talk to the old woman in green and she will talk about tinderbox and later ask about having quick mind and good heart. Action - If you see a push (hand) icon at top right, an action can be done. Try this at the water pump. Be sure that his head faces where the action is needed. Then press space bar or click on it. Hans Christian will move the lever of the water pump. Money - If you see a kick icon at top right of screen by a place or an item (not a person or animal), money can be found. Press the space bar or click on it and see coins jump out. Walk into it to take it in inventory. Go across the road from the water pump and see a fire going by an anvil. The kick icon is seen by the anvil on tree stump. Press space bar or click on it and walk into or click the coin that pops out. There's another coin at left tree stump and the barrel by the fire. There's a barrel that has a coin by the place where you met the student. Check all the crates and barrels around area. Copius Grandus - Talk to the stout man in blue and white striped pants. He takes theatrical students. He wants a reference from a cultivated person. Match girl sells 3 matches for a tuppence. 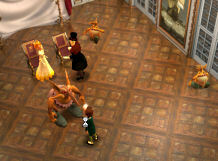 Talk to the Princess, the Scrooge-like old man and other fairy tale characters. Talk to a young boy in brown wearing a cap and he says the snake juice is up in the mill with the goblin. Mill - Go left of the town arch (entry) where the match girl is standing and see the mill up the hill at right. Go left to a side road and see a tree at the center of the path. There is coin at the base of the tree. Click on down button to get to screen below in front of the store and get another coin from the barrel. Then go up the screen and be at edge of town. There is coin at the barrel on the right and another coin on the crate on the left. Go left by the town wall. See the steps that lead up to the mill. Climb up. Goblin - Talk to the goblin. He only allows a prince with a magic glow inside the mill. Go back down and talk to the young boy in brown and wearing a cap. He says to talk to the witch. Witch - Find the witch (old lady) and see that the fat boy, Ludvig is taunting her. Move behind the boy until you get a kick icon. Kick him by pressing the space bar and he runs away. The witch gives the magic glow. She says that at the mill there is a tinderbox. Hans Christian should place the magic glow in the tinderbox and light it. The magic glow is seen at top right of screen. Hear a man scream about a goat. Go back towards the mill. On the way talk to Clumsy Hans, the short man in red wearing a wide brim hat. He asks about Billy goat. The goat will follow if you give it a carrot. He gives carrots seen at top right of screen. Walk back to steps leading up the mill and see Councilor Dunkeldorff cornered by the goat. I wonder what he's doing here. Use your tab key to place the carrots at center of top right corner of screen. Then press the space bar or click on goat. Hans Christian places the carrot in front of the goat. Walk back to Clumsy Hans, short man with wide brim hat and the goat follows. The man gives more carrots. Talk to Councilor Dunkeldorff when he passes by. Go back to the mill. Mill - Climb to the mill and talk to the goblin. He doesn't believe Hans Christian is the prince. Click the magic glow on goblin. He took it and said that he will place it in the tinderbox and give it to the Princess. The goblin still waits for the prince. Enter the mill and take the snake juice sitting on top of a crate left of the room. The goblin appears and warns about danger to the Princess, big troll and darkness. Student - Find the student. He at the area left of the gate close to the match girl. Give him the snake juice. He automatically gives 6 coins and the money is added to the purse. Talk to him several times. He can give you a reference or find you a proper job; just visit him at the Artisans quarter. Find the Princess by the water pump. Talk to the Princess and see the goblin appear. The goblin gives the tinderbox with magic glow to the Princess. The spoiled Princess takes the magic glow into herself and throws away the tinderbox. 'You thoughtless fool'. The tinderbox is picked up by the Master of Darkness wearing pink and white striped pants and the Dark Lord says 'Your wish is my command'. The Princess wants a cake. Cake - Go to the far right path when in the plaza square screen. Talk to the cake seller and buy cake for a tuppence (a coin). Hear the Princess scream. Run to where she was and find her gone. Talk to the townspeople and some would say the mill is dark. The student advises to buy matches. Talk to the young boy and learn that the Princess was taken by trolls. Talk to the young girl and she said that if the tinderbox and magic glow are not joined the trolls will take over the country. 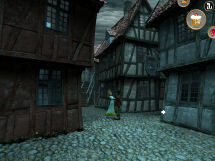 Match girl - Go to the match girl left screen from the town's gate. Buy 3 matches for a tuppence apiece. Mill - Go up to the mill and hear the Princess. Enter and see 2 trolls. It's dark in here. Use a match to light one of the candles on the wall. 'Horrible light!' The trolls do not like the light and leave. Cage - Use the lever on the left post to lower the cage. Use the lever at bottom center of the cage and see the lever go down and back up. Immediately go to the lever on the right and click on the lever to raise the cage while the floor is loosened from the bars. The Princess and Hans Christian exit the mill. The sky darkened and growling is heard. The town is loaded with trolls and rats. You can kick rats out of the way. 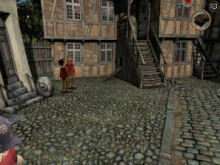 If a troll catches Hans Christian, money will be taken; the game ends and has to restart from the mill. Talk to the Princess. She wants to go home and out of the darkness. From the mill steps, go right. Be sure that the Princess is following Hans Christian. Go down to the bottom screen. See trolls around the tree area. Place the cursor on left bottom of screen and go that way. Hans Christian and the Princess will now be at the area where the cake seller was earlier. The Princess wants her cake now. Give her the cake. Go right and then left. Go down the path and see the guard by the gate. The Princess enters through the gate and out of the Poor Quarters. Talk to the guard and he tells Hans Christian to leave. Go back to the right screen and this time go to the top of the screen to the old tree with a fire at the base. Talk to the witch. She tells Hans Christian to enter the tree and bring the cauldron. Hans Christian continues his writing at the puppet theatre. Trolls come crawling out from every corner of darkness. Tunnel - Go forward and see a brown door. Try to enter and hear a bark. Continue down the tunnel but do not take the cauldron yet. Let's check this place out. Go farther down the tunnel and see a black and silver door. There's growling behind the door. Farther down is another door - a gold one. There's growling behind this door too. At the end, see a plain wood door at right. Enter and see an armor shape on the door at the end. Look through the head. See the King being informed by Councilor Dunkeldorff about the trolls. Councilor Dunkeldorff says that she will save the princess if the King gives him the Princess in marriage and half his kingdom. Go back to the tunnel and pick up the cauldron. The witch drops down a ladder. Climb up and give her the cauldron. She wants a dead crow, snail slime and jar of snake juice. Talk to the witch again. She gives a copper box to collect the snail slime. Hint: Look for coins by checking barrels, side of roads and other active spots while walking around the quarter. Be careful in getting close to the guard. He will fine you for wearing beggar clothes or for begging in the streets after checking your purse. Talk to the young boy with the cap, the poor girl and Clumsy Hans to get great clues. Be sure to talk to everyone repeatedly to find out other clues and information. The goblin will appear once in a while. He is also a source of clues. Dead crow - Exit at bottom screen. Talk to Clumsy Hans, the short man wearing a hat by the goat. He gives Hans Christian a dead crow. Swineherd - Sometime somewhere see the swineherd who is a tall man wearing a feathered hat. He says that he is a prince and that he needs to test the Princess. Student: Talk to the boy wearing a cap when you see him. He says the student is looking for you. Hansen the Tailor - Go right to the main plaza. See the tailor shop on the left with a scissor hanging over the door. Enter the shop and talk to the tailor. He's looking for an apprentice but he needs reference. Exit the shop. Cow - Go left of the tailor shop and then go left again. See a pig on a side street. Enter the shabby entrance before your reach the pig. Click on the cow. Talk to the poor girl. She says the student wants you. He lives in the gray house by the old ruins. Go back to the plaza and go left. Go left (right will be the entrance to where the witch is located) again. See and then talk to the Princess. Enter the gray house behind her by using the entrance on the side close to the arch. Snail slime and snake juice - Go down to the bottom screen and talk to the student. He says the snake juice is useless. He is now extracting snail slime. He also gives a reference for the tailor. It is noted at the personal diary. Go down the screen again. Take the snake juice from the bookshelf at right. Take note of the stone lion head with one red eye above a sealed entrance. Snail slime - Go to the lab setup left of the door. Position Hans Christian in front of the metal pot. Use the copper box on the metal pot at left. Increase the flame of the burner under the flask. Watch the extraction process. Click again on the pot to pour the snail slime and then click again to get copper box with snail slime. Witch - Go back to the witch by exiting the student's house, go right until the entrance to the ruin where the witch is located. Talk to the witch. She says that the Master of Darkness walks among us and that he wants the Princess. Give her the 3 items she wants: dead crow, snail slime in the copper box and the snake juice. She gives pennant of the Lion Knight. She said that the dog will give Hans Christian money. She flies away afterwards. Tailor - Exit, go down and then go right to the plaza. 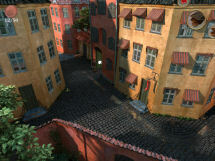 The tailor shop is the building on the left with a scissor hanging above the door. Enter the shop and talk to the tailor Hansen. He needs references. Use the personal diary on him. Look at the crystal ball on the table. You get the crystal ball when you finish the King's uniform. Buttons - Go to left screen. Look close at the boxes of button on the hutch by the window. Take gold buttons. Turn around and look at the locked cabinet case. Hansen the tailor says some brat (Ludvig) stole the key. 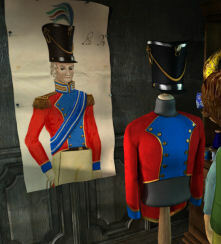 King's uniform - Go to left screen and see the unfinished King's uniform on the body form. Use the gold buttons on the body form. Hans Christian will automatically sew them on based on the pattern on the wall. Talk to the tailor again. He gives Hans Christian new clothes. He wants you to go outside for more items to finish the King's uniform. Collect the items needed - Go back and study the pattern of the uniform on the wall. The uniform needs sash, 2 epaulets, collar and feathers for the hat. Epaulets - Exit the store and go right to the plaza. Talk to the lady selling collar at the far end of the plaza. Buy an epaulet for 12 coins. She says the milkmaid bought the other epaulet. Cow - Go right and then right again. Go through the entrance by the pig and talk to the poor girl. The cow is hanging up there and he might be thirsty now. Go left of the ladder and take the bucket. Use the bucket in front of the pump. Use the lever of the pump. Take the bucket of water and climb the ladder. Place the bucket in front of the cow. The weight of the cow increased and it lowers it to the ground. Talk to the poor girl again. She gives you an epaulet which he uses as a cow brush. Exit to go back to the road. 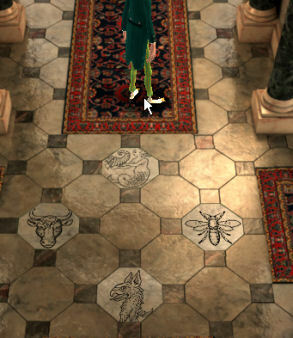 Money, Swineherd and Princess (not necessary for completion of game) - See the princess snogging with the Swineherd. Talk to the Princess and she refuses to go with you. The swineherd says to feed his pig and he'll give you money. Kick the pig and he then follows Hans. Go to several dandelions seen on the street. Get the pig to eat 3 dandelions and then bring him back to the swineherd. Talk to swineherd and he gives money. Talk to the Princess and he says to get better clothes so that she can be seen with her. Ludvig and key - Talk to the young boy and he says to kick Ludvig. Go to Ludvig behind the woman selling collars and now carrots at the end of the plaza. Talk to him and he proudly claims that he stole the tailor's keys. Stand behind Ludvig and kick him. The key is taken automatically. Feathers - Look for and talk to Schneider, the man wearing an apron several times. Now that he sees that you have a job, he is not worried that his cockerel will end up in the witch's brew. Look for a cockerel (rooster) around town. I saw him by the gray house of the student. Kick the rooster and pick up a feather. Follow the rooster and kick him a total of 5 times. And then pick up the feathers to get 5 feathers. Tailor shop - Go back to the tailor shop. Open the cabinet by the window using the key taken from Ludvig and take the sash. Look at the big cabinet behind the tailor and take the collar from second to bottom shelf. Go to the unfinished uniform and use the epaulets, the feathers, sash and collar on the uniform. The uniform is finished. Take the King's uniform. Take your payment from the tailor - the crystal ball from the table. Talk to the tailor again. He says that he has fine clothes for a bargain cost of 50 copper pieces. Find more money: Remember what the witch said, find the dog if we need more money. Look at the crystal ball and see that it looks familiar. Also remember what the man with an ascot tie said that the crystal ball is from the Lion's tower. Bulldog - Go to the student's gray house. Exit the tailor's shop, go right, then left, left again and see the gray house at the far corner. Enter and look at the lion's head on top of the stone entrance. Place the crystal ball on the eye socket. The stone entrance opens. Go down the ladder and talk to the bulldog. He is sitting on top of the treasure. Use the lion pennant on bulldog. He goes down and sits on the pennant. He allows you to take as much copper you can carry. Open the chest and take all that the game allows - coins to make a total of 50 in the purse. Go outside and forward to plain wood door at end of tunnel. Enter and look through the head of the armor shape on the door at the end. See the King missing the Princess and talking to Councilor Dunkeldorff. Dunkeldorff reports that she is kissing a swineherd. The King now agrees that Dunkeldorff bring her home in exchange for his kingdom. Go back to the copper bulldog's room, climb the ladder and exit the house. Tailor: Go back to the tailor and give him the 50 coppers. The purse is empty. Hans Christian is now well clothed. Hear the clock chime. Save game here. See trolls are around. Try to evade the trolls and go to the student's gray house. Go to the right, left, left again and see the gray house at the corner. Talk to the Princess standing by the gray house. Go left, left until the plaza and bottom right to the where Ludvig and the collar seller were standing earlier. The guard stops Hans Christian from entering. The Princess follows and is allowed to go through. She calls to Hans Christian to follow. Hans Christian continues to write. Who was that fierce looking man? Go to the top exit where the fountain is seen. Go forward until Councilor Dunkeldorff talks to you. He will take the Princess back to the palace. Talk to the people and they will say to go talk to the sculptor who leaves next to the theatre. Young girl - Follow the Princess right of the theatre. Go forward and talk to the young girl at the corner. She found a magic glow (the Princess must have dropped it) and she needs it to see her granny. Sculptor Chisel: Continue to the right until you see the sculptor in yellow with curly hair in front of a house by the pier. Talk to him several times with the diary selected in inventory and he tells you to follow him to his studio. Money - Check any active spots to collect coins. There's a coin at the base of the theatre's column. Go left and see blocks of stone in front of the sculptor's house. Check a stone block to get a coin. The front wheel of the cart in front of the sculptor's house has a coin also. Studio -The sculptor wants Hans Christian to arrange the sculptures. 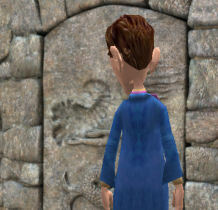 Take note of the stone mermaid on the rock wall behind the male statue. Look at the picture on the wall. Arrange the statues similar to the picture. Push the goat while standing in front of it. Push the male statue while standing to the right of it. Push the female statue while standing to the left of it. The sculptor gives 5 schillings. He wants you to go to the harbor and help unload stones. Stone blocks - Exit the room and the sculptor follows. They go back to the harbor. See the wooden crane. The young boy is inside the wheel. Talk to the boy and he said for a coin, he will help. Give the boy a coin. Click on the big wheel and he lifts the hook. Use the lever at the base of the crane to turn left. Click on the big wheel again and the boy will lower hook. Click on the big wheel again and the boy will raise hook. Use the lever again to turn right. Click on the big wheel again for the boy to lower the hook. Sculptor Chisel gives Hans Christian 5 schillings and a recommendation to talk to Master Grandus. Copius Grandus: Go to the theatre and talk to Master Grandus. Talk to Master Grandus, the theatrical teacher. Use the diary on him to show the reference given by Sculptor Chisel. Rose water - Grandus wants rose water. Talk to the woman seller standing by the tree left of the theatre. Buy rose water for 3 schillings. Go back to Grandus and give him the rose water. 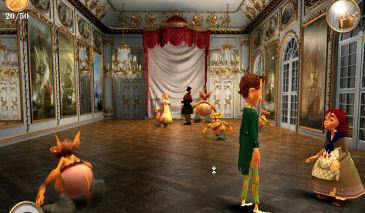 Prop boy - They enter the theatre and Hans Christian is introduced to Romeo. Romeo shows the sounds making items right of the stage. Copius will say 'Hark!' when he wants a sound effect. The wheel on the left makes wind sounds. The metal sheet makes thunder sounds and the musical instruments make bird sounds. Romeo shows the background levers left of the stage. Copius will say 'Behold!' when he wants a background change. The lever on the left shows forest background. The right shows a mountain with lightning weather. Romeo promises to give Hans Christian the rat if he messes up Copius' performance. Copius recites his work - The Wanderer. Follow his cues of harks and beholds and use the background and sound effects accordingly. At the end of the recitation, Copius rejects Hans Christian as a student but gives him an old stone cornucopia. Romeo gives his rat that is good for scaring fine ladies and stupid boys. Exit the theatre. Be sure to talk to everyone repeatedly to find out clues and information. Learn from the witch that dogs can smell trolls. The cake woman is selling the cakes for 2 coins. Sculptor Chisel says there's a crying mermaid by the pier. Go to bottom of screen from the fountain. Then go right to be close to the dock. Talk to the sleepy shepherdess. There's a coin by the crates left of the screen. Mermaid: Go to the right and see a crying mermaid. Look for coins around here. Talk to the mermaid repeatedly and find out that she lost her little prince. The cheeky boy took it. That must be Ludvig. She will give you the prince pennant and all his hidden silver treasure. Learn that the prince is a statue. Love letters: (This love letter delivery sequence can be started in Act 4). Go to the left of the theatre. There's a coin on the wheel of the carriage. Go forward until the corner where the tobacco shop is located (see a pipe hanging on the wall). Talk to the chimneysweep. He asks that you deliver a letter to the shepherdess. He gives magnesium which is good for the birds (flammable). You can read the letter in inventory. Go and give the letter to the shepherdess at the dock. She gives a letter in reply. Deliver the letter to the chimneysweep and he gives another letter in reply. Deliver the letter to the shepherdess and she gives another letter in reply. Go back to the tobacco shop corner and see that the chimneysweep is gone. Search for Ludvig: During your running around, talk to the sculptor and he says that it is Ludvig that stole the mermaid's statue. The shepherdess says to check the old quarters. Cross the bridge close to the wooden crane and be at the Aristocrat Quarter. Go to the right and get coin by door. Take the road across the bridge and then go left. See the chimneysweep up the roof. He is not accessible. 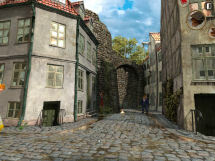 Take the road on the right and see Ludvig standing by the gate of the palace. Go to him and he runs through an entryway on the left. Follow Ludvig. See that he is in a stone gazebo. Try to talk to him. Go close to him and use the rat on him. See the rat scare Ludvig and he runs away. Take the statue from the floor of the gazebo. Hear Councilor Dunkeldorff trying to force the Princess to marry him. Mermaid: Exit the garden and go to the bridge. Cross the bridge and see Ludvig had the guard raise the bridge to stop Hans Christian from going back. Go to the mermaid at the pier and give her the prince statue. She gives the mermaid pennant. Look at the pennant in inventory and see that it is a mermaid holding a cornucopia. Where did we see that? Go to the left and see tailor Hansen. Talk to the tailor several times and he says that he has new clothes for a baron but he will sell it to you for 50 silver coins. Go to the sculptor's studio left of the theatre. 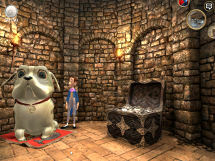 Silver Bulldog: Enter the sculptor's studio and walk to the stone wall with the mermaid. Use the cornucopia on the indent of the mermaid statue. The secret entrance opens. Go down and see another but bigger Bulldog. Talk to the bulldog. Click the mermaid pennant on him. He goes down and sits on the pennant to rest his paws. Take 50 silver coins from the chest. New clothes: Exit the studio. See that the trolls are here. Go to where you saw the tailor by the docks-pier. Talk to tailor and pay the tailor for the new clothes. Now Hans Christian looks like a prince. Go to the bridge by the wooden crane. The guard lowers the bridge to allow Mr. Andersen through. 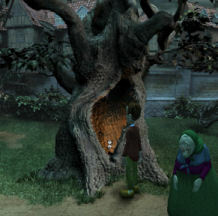 Hans Christian wonders if the tinderbox is connected to the darkness and if there's a third dog. If you haven't yet, you can do the start of love letter delivery sequence described in Act 3 here in Act 4. Chimneysweep: Go to the road across the bridge, then turn right and see the chimneysweep. Deliver the letter given by the shepherdess in Act 3. He gives a reply. Read it in inventory. They will meet at the rooftop where they kissed. Go forward towards the gated building - Sempee Labore and then left on the road. See the shepherdess. Give her the letter. She gives a Knight of Swanfeather pennant. King: See the king and Councilor Dunkeldorff talking. Talk to the King and learn that he misses his daughter so. Give the King the uniform. He says for Hans Christian to visit him at the palace; on later thought after learning Latin and good conduct. Councilor Dunkeldorff: Talk to Councilor Dunkeldorff. He wants Hans Christian to follow him to his home so he can give reference for Latin school. Follow him inside his house and then room. Give him the personal diary. Councilor Dunkeldorff tricks Hans Christian and placed the diary on top of the bookcase. Now, Hans Christian does not have any reference. Talk to Dunkeldorff several times. He punches Hans Christian. Councilor Dunkeldorff leaves for a meeting with the King. Go back inside the house and talk to the maid. She was told not to allow anyone in. Well, except that handsome chimneysweep. Chimneysweep - Exit the house. Go left to the gate wall of the Latin school, Sempee Labore and see the chimney sweep. Talk to chimneysweep and he gets reminded about his appointment at Councilor Dunkeldorff house. Go back to the Councilor Dunkeldorff house. Enter and the chimneysweep follows Hans Christian. Annalise, the maid welcomes the chimneysweep while Hans Christian hides behind the coat tree. Bookcase - Enter the room while the maid is occupied. Go to the book case, stand at right side and push it. Take the personal diary and the tuition document that fell off the bookcase. Read the tuition document in inventory. It states that by King's order, tuition is set aside for Hans Christian to study at the Latin School. See that removal of the bookcase revealed a swan stone door. It looks very familiar; just like the Knight of Swanfeather pennant. Sempee Labore (Latin School): Exit the house and go left. Enter the gated area at the corner. Enter the building. See that Ludvig is here. Go left and talk to the old teacher. Give him the tuition document. The teacher wants you to do the Astrology exam. 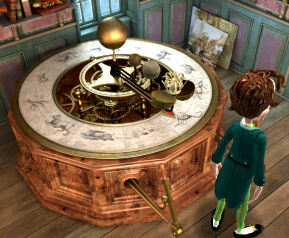 Hans Christian has to align the planets correctly using the 2 levers. Ludvig - Go right and talk to Ludvig. He brags that he took something from the teacher. Go behind him and kick him. Automatically get a gear wheel. Astrology table - Go right and see the astrology table with 2 levers. Use the left lever and see that it doesn't work. Use the right lever and see that the planets are moved. Use the gear wheel on left lever and see the planets move. Use the left lever until the outermost, big planet is close to Hans Christian. Use the right lever until the 2 inner planets are aligned close to Hans Christian. Take the small crown seen when the outermost large planet opened. The teacher gives Hans Christian his diploma for Astrology and Latin and told him to leave. 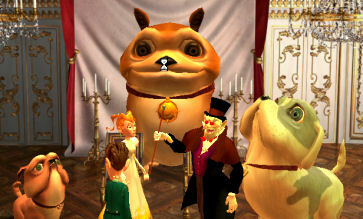 Gold Bulldog: Go back to Councilor Dunkeldorff's house. Go to the swan door and use the small crown on the indent above the swan. Go down the ladder and talk to the humongous bulldog. Give him the Knight of Swanfeather pennant. Take 50 gold coins from the chest. Climb up the ladder. Master of Darkness and Dark Lord: Go to the left and look through the door in the kitchen. Listen to the Dark Lord and guess who - the Master of Darkness, Councilor Dunkeldorff. Dunkeldorff is holding the tinderbox. The Master and Dark Lord both want to marry the Princess. The Dark Lord hits the tinderbox and it falls off through a hole in the grate. He changes Councilor Dunkeldorff to a rat and pulls Hans Christian into the kitchen. Now both the Princess and Hans Christian are locked in. Escape the kitchen - Look at the small fire in the fireplace. Use magnesium on the fire and it flares up. The chimneysweep calls down and says that he will help but to put out the fire first. Use the water pump by the sink. Click on it again to move the copper pot filled with water to the bellows. Use the water filled bellows. When the fire is extinguished, a ladder is sent down by the chimneysweep. Climb and be on the rooftop where the chimneysweep faces the shepherdess on the roof of the next building. Enter through the window at right. Hans Christian says that the tinderbox and the magic glow must be obtained. The King and the Princess have a reunion but in comes the baddie. The Dark Lord places a spell on the King and Princess. Nebu-tara. He throws Hans Christian out and locked the throne room. Tinderbox - Walk forward and the goblin appears. He advises to find the magic glow but first the tinderbox. Walk a bit and when you get a close up of Hans Christian turn to the armor standing on the wall. The open door icon is seen at top right of the screen. Open the secret door. Go through the secret door and see that this is the path behind the wooden door where the bulldogs were visited. Turn to the left and pick up the tinderbox. The goblin appears and he advises to go to the throne room. Also he says that the Dark Lord has bewitched the throne room and the way there would be difficult. Go back through the wooden door and out through the armor door. Find the throne room - Go down, left and up to the next door. Go forward and meet the King. On the floor, see different pictured tiles. Since the first stone secret door encountered had a lion head, take the lion corridor. Continue to walk and at the end of the corridors, see 3 doors. Enter through the middle lion door. Continue forward until you see a troll. Take a look at the pictured tiles on the floor. Since the second stone door encountered had the mermaid and cornucopia, take the mermaid with cornucopia corridor. Continue to take the mermaid corridors whenever a new direction is needed. At the end of the corridor, see 3 doors. Enter through the left mermaid with cornucopia door. Go forward until another troll. 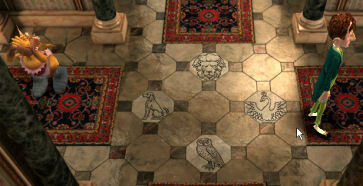 Take a look at the pictured tiles on the floor. Take all the crowned swan corridors and enter through the swan door. Enter through the swan door. Magic Glow: See that the Dark Lord is casting a spell on the Princess. The room is full of trolls. See the young girl that has the magic glow at bottom right corner of the screen. Go to the young girl while evading the trolls. Place the magic glow at the center of the inventory at top right of screen. In my gameplay, I hugged the left wall and then cross over to the right when I reached the bottom of the screen. I saved my game at every clear path or change of screen. The trolls will take money from your purse at every encounter and you have to start by the door. 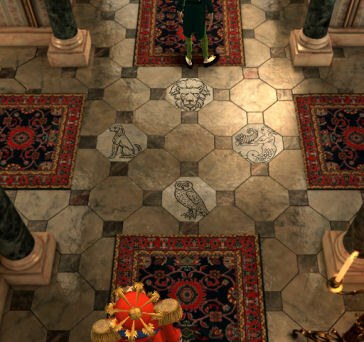 When the money is gone, Hans Christian is at the corridor outside the throne room. 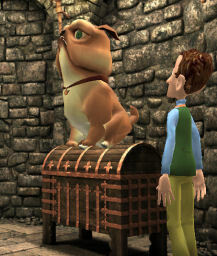 You can either go back to the saved game or go down to the dogs to get more coins to fill your purse. Use the tinderbox on the young girl with the magic glow. The magic glow is placed inside the tinder box. Go to the Princess and Dark Lord. You can either use the tinder box on every troll on your path or go directly to the biggest troll and use the tinderbox on it. Then use the tinderbox on the Dark Lord. It ended as quickly as it started. Hans Christian is destined for other great adventures.